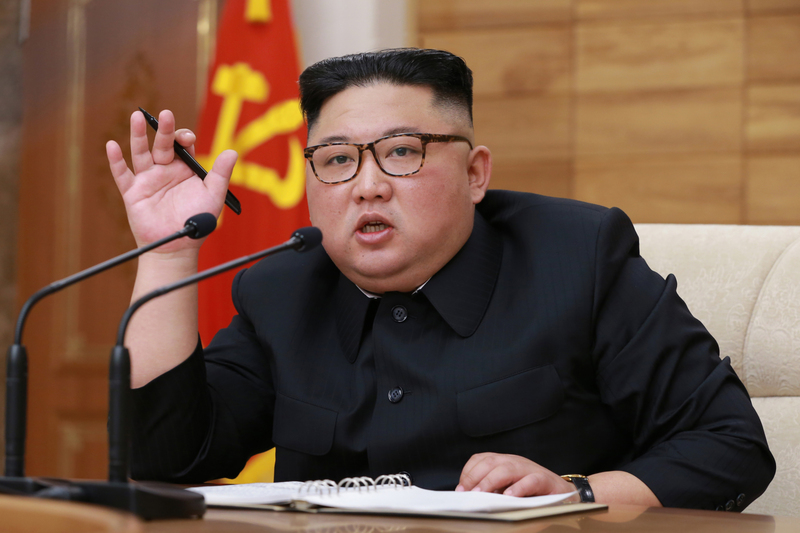 Kim Jong Un speaks during a March 9, 2019 expanded plenary session of the WPK Political Bureau (Photo: Rodong Sinmun). 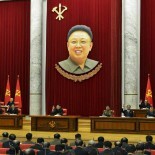 The Workers’ Party of Korea [WPK] Central Committee Political Bureau [Politburo] met on the second floor of the WPK Central Committee office building on the afternoon of 9 April (Tuesday). 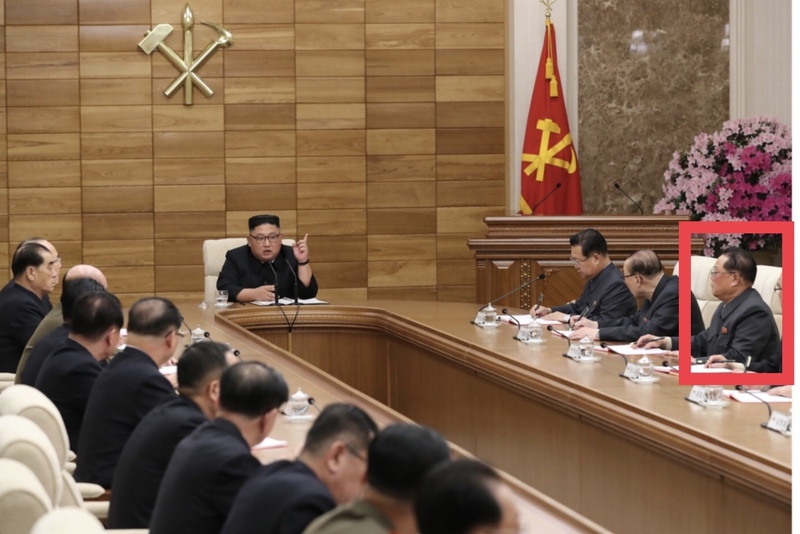 Kim Jong Un (Kim Cho’ng-u’n) guided the gathering of Members and Alternate (candidate) Members of the Political Bureau along with provincial party chairs and some of the Central Committee’s department directors, senior deputy directors and deputy directors attended the meeting. This was the first observed appearance of WPK Vice Chairman and Propaganda and Agitation [Information and Publicity] Director Pak Kwang Ho (Pak Kwang-ho). Pak had not been observed in state media in nearly 180 days (around October), except when his was election as a deputy to the 14th Supreme People’s Assembly was announced on state radio on March 13. Pak was in ill health and took an extended leave of absence. Standing in his place at some events was PAD’s long time iron hand in the velvet glove Kim Ki Nam and for other events PAD’s Senior Deputy Director, former Rodong editor Ri Yong Sik. 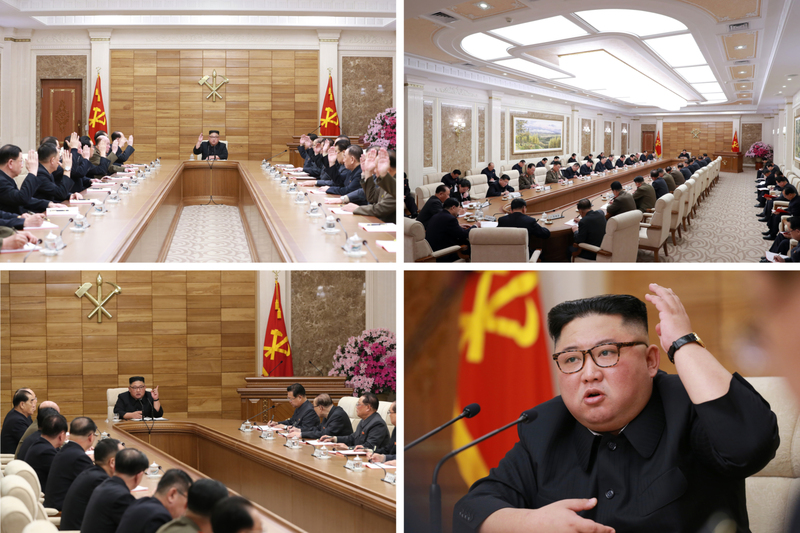 Views of the April 9, 2019 expanded Politburo meeting at the WPK Central Committee office building (Photos: KCNA/Rodong Sinmun). 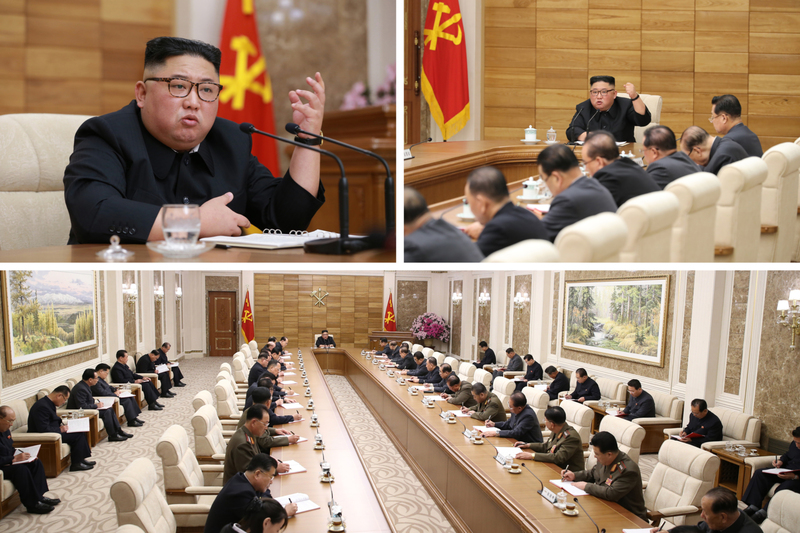 Kim Jong Un presides and leads the expanded session of the WPK CC Political Bureau on April 9, 2019 (Photos: Rodong/KCNA). This article was written on 10 Apr 2019, and is filled under 14th SPA, 2019 elections (SPA), 2019 Strategic Rhetoric, Agriculture Department, An Jong Su (WPK LID), basic party organizations, Cadre Affairs, Central Committee, Central Military Committee, Central Party Affairs/Cadres 5th Section, central party life, Choe Hwi (PAD], Choe Jong Ryong [SHW WPK], Choe Ryong Hae, Choe Tong Myong [SED], Civil Defense Department, Col. Gen. No Kwang Chol (KPAGS), colonel general, Committee for the Peaceful Reunification of Korea, Committee for the Peaceful Reunification of the Fatherland (CPRF), Comprehensive Affairs, corps command, corps commanders, corruption, critical infrastructure, DPRK Cabinet, DPRK Constitution, DPRK education system, DPRK Energy Policy, DPRK External Relations, DPRK Intelligence Community, Events Management Section, Executive Policy Bureau, Finance and Accounting, Financial Planning Department, Five Year Economic Plan and Development Strategy (2016), Gen. Choe Pu Il, Gen. Jo Kyong Chol, Gen. Kim Yong Chol, Gen. Ri Myong Su, Gen. Ri Pyong Chol, General Affairs, gsd, gsob, Guard Command, ideological slogans, Information Section, Jong Kyong Thaek (State Security), Kang Yang Mo, Kim Jae Ryong (Jagang WPK Provincial Committee Chief Secretary), Kim Jong Un Visits, Kim Jong-un, Kim Ki Nam, Kim Ki-nam, Kim Nung O (NPyongan WPK), Kim Phyong Hae (Cadres/NPYPPC), Kim Tu Il, Kim Yo Jong, Kim Yo-chong, Kim Yong Nam, Kim Yong Su (WPK CC DD), KJI Personal Secretariat, KJI-Ko Yong Hui Family, Ko In Ho, Korean People's Army Supreme Command, Korean People's Internal Security Forces, Korean People's Army (KPA), Korean Workers' Party (KWP), KPA General Political Bureau, KPA General Political Department, KPA General Propaganda Department, KPA General Staff, KPA Organization Department, KPA Party Life, KPA supernumerary organizations, KPA Supreme Command, KPA WPK Committee, kpif, KWP Science and Education Department, Light Industry Department, Machine Building Industry Department, Main Office of Adjutants (Central Party Office #6), military security command [msc], ministry of people's security, Ministry of State Security, Ministry of the People's Armed Forces (MPAF), MPAF GPB, Mun Kyong Dok, Namp'o WPK Committee, Notification, O Su Yong, Office of Military Officers, Organization and Guidance Department, Pak Kwang Ho (PAD), Pak Pong Ju, Pak Tae Dok (N. Hwanghae WPK), Pak Thae Song (KWP CC Dept), Party elders, Party History Institute, party life, Political Bureau, primary party committees, Propaganda and Agitation Department, Provincial Party Committees, Pyongyang Defense Command, Pyongyang WPK Committee, Ri Chol Man (DPRK Vice Premier/Minister of AG), Ri Hi Yong [NHAM WPK PC], Ri Ju O (DPRK Vice Premier), Ri Man Gon (N. P'yo'ngan WPK PC), Ri Pyong Chol, Ri Sang Won (Yanggang WPK PC), Ri Yong Ho (FA), Ri Yong Rae, Ri Yong Sik (Rodong editor), Ro Tu Chol, rural management committees, Ryang Jong Hun [NHWA WPK PC], Ryang Won Ho (PHI), Second Economy Commission, Secretariat, State Affairs Commission, State Planning Commission (SPC), State Security Department, Supreme People's Assembly, Tae Jong Su, United Front Department, Worker Peasant Red Guard, Workers' and Social Organizations, WPK Economic Affairs Dept, Yang Hyong Sop.